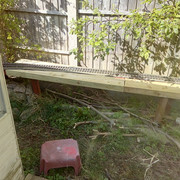 This afternoon we have installed two straight sections. Glue and screw them together and leave overnight. Tomorrows work is applied jiggery pokery saw work. I plan to cut the new intersection for the outer curve, the runnoff from "the drag strip" and finally (hopefully) install the third straight section. 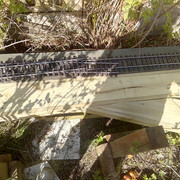 This does however have a set of points running across it. 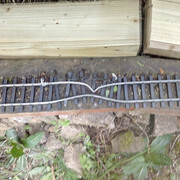 My plan is to scrap the existing lead out and build a new one and the glue and screw that the new third piece. 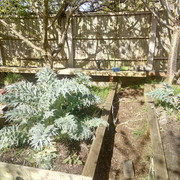 The large plants growing in the raised beds are cardoons and globe artichokes. This is the second length showing the problem with the points. I will lift the points after tea. Re: Thump.... Thump.... Thump... - the final installment! Busy day with a bandsaw! After having used two corbflakes boxes to make templates with... The new intersection of the X-lawn track and the Great North Straight has been cut. As usual the bandsaw blade bounced around cut a less than straight line -but it was enough. 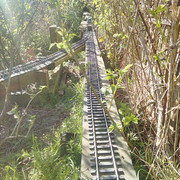 The lengtg for the new outer inner track and outer track abbutments made for a few "words" but both pieces have mated to their side with a little persuasion wih G cramps. This shot shows the new "squared off" end of the Great Way Round curve. The track currently feeding the outer straight will next feed the inner straight. This will result in a slightly tighter curve. 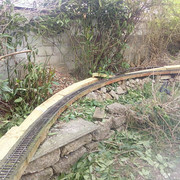 The new curve added will form the outer track. Thus the outer track will have no points and be suitable for high speed running. Today I am taking it slow... I knackered my left knee on Wednesday and the thing is really letting me know about it! So, it has been out with the angle grinder and the flap disc to make sure all the ends of the facets aproximate "square". I like to use Cascamite resin glue to join the ends of the facets. I also mix it slightly sloppier than the instructions say. This allows me to spread the glue like peanut butter -rather than butter. These are the first two pairs of facets to be joined. They are lying inverted on a sheet of glass. Both ends have been " buttered up" with glue. 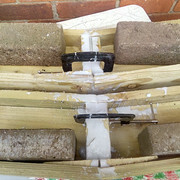 The bricks hold them flush to the surface and the G cramps tighten the joint to contact. Any excess glue is slopped onto any joint that is local. The glue will set in about eight hours at this temperature, which is fine as I am busy tomorrow morning. Probably Sunday the next two pairs get glued and so we continue. The last pair of facets are now setting on the glass sheet. I have rough laid out the pieces to see what plant needs attacking now. Most of the heavy clearence was done over the weekend with a chainsaw... What you see below is the result of sneezing with a 2kW electric chainsaw!! !